What others say about chiropractic care can help you make the right health care choice. Review a selection of Kromrey Chiropractic patient testimonials below and please email us or contact our office if you have any questions. Donna has been a practice member of our office for 23 years. She originally came to us due to neck and back pain. Her body tells her when she needs to see the doctor, and if she doesn’t see Dr. Shawn for several weeks, her body gets out of alignement. Because she has athritis in her neck and spine this can lead to severe pain. 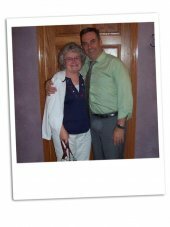 Dr. Shawn and chiropractic have helped Donna manage arthritis of the neck and spine. With regular adjustments she’s been able to stay pain free and maintain her mobility. What first brought us to chiropractic was that I couldn’t turn my head because of neck problems. I started bringing my son at only 2 years of age due to ear infections. I also started bringing my daughter in for maintenance care when she was little. Since that time I’ve changed the way I view chiropractic care. Chiropractors get to the source of the pain so you don’t have to rely on taking medication. It’s great relief for pain and sickness, such as colds and ear infections. What I want to be sure that others understand about Kromrey Chiropractic is that Dr. Kromrey treats you like a person and listens to what you have to say. He doesn’t rush you out the door. And, he always has a good joke to tell! 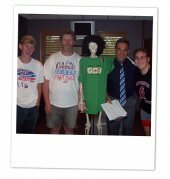 My chiropractic story is a two-part one. In the early 80’s I went to a chiropractor for my back. After 3 weeks I wasn’t getting any relief and it was getting worse. I ended up at the hospital with an MRI where they discovered I had a herniated disc with particles lodged under the nerves in my lower back. Surgery was performed and they removed 3/4 of the disc and also the particles from under the nerves. Recovery was good but I always had to watch my activity levels. In 2004 I was golfing and accidentally tripped getting out of the golf cart. I was in severe pain and knew I didn’t want to go through surgery again. People were telling me of the good luck they were having with Dr. Shawn. I decided to try his treatment and after a while I started getting relief. He has helped me tremendously and I still go once a week to keep me healthy. Dr. Shawn is a dedicated and caring person. Give him a try. It’s not always and overnight fix, but think of all the years your body has been abused. As so often is the case, Mom first sought out chiropractic care for her own back pain. Once she learned the benefits of chiropractic in strengthening the immune system, she started her kids on care for their recurring ear infections. Hello, my name is Louise. I started coming to Kromrey Chiropractic in mid-June on the recommendation of my massage therapist. I have been suffering from neck discomfort as well as chronic hip pain. Since getting treated by Dr. Kromrey, I have had little to no neck issues and the pain in my hips has greatly subsided. Actually, it has been reduced to almost nothing. Dr. Kromrey and the staff at Kromrey Chiropractic treat you and your symptoms individually and give recommendations based on your complaints. It isn’t a one fits all or the same adjustment for everyone. If you are in pain (or even just need a joke of the day), don’t hesitate to come and see the doctors at Kromrey Chiropractic. They will advise you on what type of care is best for you. If you think that you or a loved one is a good candidate for chiropractic care, contact Kromrey Chiropractic to arrange a thorough examination in our practice.